The last few decades have been brutal ones for the romantic music collector. In the early 90’s , popularity of the compact disc was making the frayed-edged cardboard LP cover look like the Betamax cassette’s best buddy – prices of the new silvery product rocketing as fast as the typeface credits shrank to eyeball-impairing micro-scale. Anyway – we all agree you cannae beat having a music shop down the road. Ideally all record buying fans would choose to live on the corner of London’s Broadwick Street and Berwick Street but unfortunately this can’t be the case for most of us (actually my ideal, for a spate of time, would have been to live IN the Blue Posts between shopping trips). Here in the 21st century the glory days of Soho’s ever unfolding treasures seem a distant memory; classic LPs from the last 60 years an elitist’s dream & unattainable to most. So it is with great pride that I draw your attention to a crown jewel nestled in the heart of deep downtown Ramsgate. For the last 20 odd years HOWLING SOUNDS has been serving the needs of the Thanet community with a most wide range of diamonds in the rough. Rock, soul, pop, dance, folk and whatnot (I kid you not) abounds in vinyl, CD and even lil’ ol’ cassettes tapes. Dave Howling ( yes. howling. ) a committed music addict, took over the shop in 1991, having worked in the actual biz side of the industry at weekly newsprint bible Melody Maker for many a year. At that time, the new CD medium had become a household word and people were not sure whether to bother with their ties to vinyl, turntables & lack of shelf space. In a smart move, Dave never made any attempt to rid his shop of the old guard long players, EPs and 7″ singles that still take up most of his Aladdin’s Cave of joy. Through these years he has seen the interest slowly wane & wither but in these last few years start to gain a momentum unlike any time since the arrival of the acursed demonseed CD. One suspects that the current world of music appreciators has now become so accustomed to the download convenience that, when it comes to a truly quality audio treat or present (even to just yourself – or esp just yourself!) a plastic faceless coaster just won’t cut the moutarde. Enter the variable world of 12″ records (singles as well) where you might find yourself with a Funkadelic sleeve – designed to be near impossible to finish reading in a single lifetime, or blessed Beatles ‘White Album’ crammed with posters, portraits, collage, lyrics, etc. Not to forget all them indulgent progressive rock 70s’ album covers. We won’t even touch on how great all the music can be. 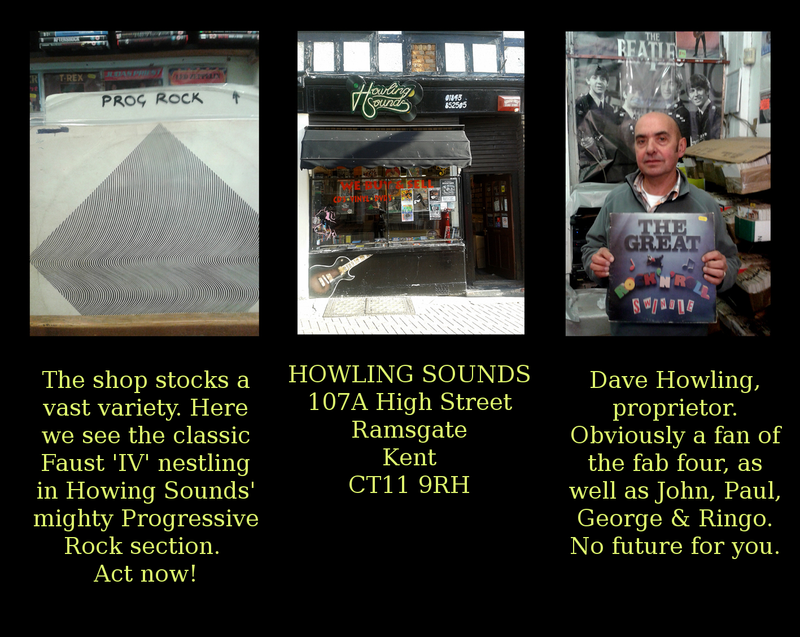 Howling Sounds can provide you 6 days a week with a mighty choice of bizarre, jazzy, punk, techno grime (!! ), vintage, not-so-vintage and sometimes ultra-collectable vinyl joys and y’all should get your music lovin’ asses through his door and enjoy what is there waiting for you. Be warned: I already bought the Pinky & Perky in Space 7″ so don’t even hope. P.S. Note, the shop also sells assorted stereo equipment for home & DJ needs. Walls are uniquely decorated with absolutely crazy looking guitars!! Not sure how much longer Dave Howling is going to let his Grand Funk Railroad LP’s graze amidst all those darling Van der Graaf Generator & other prog classics!! Possible legal action will be taken. 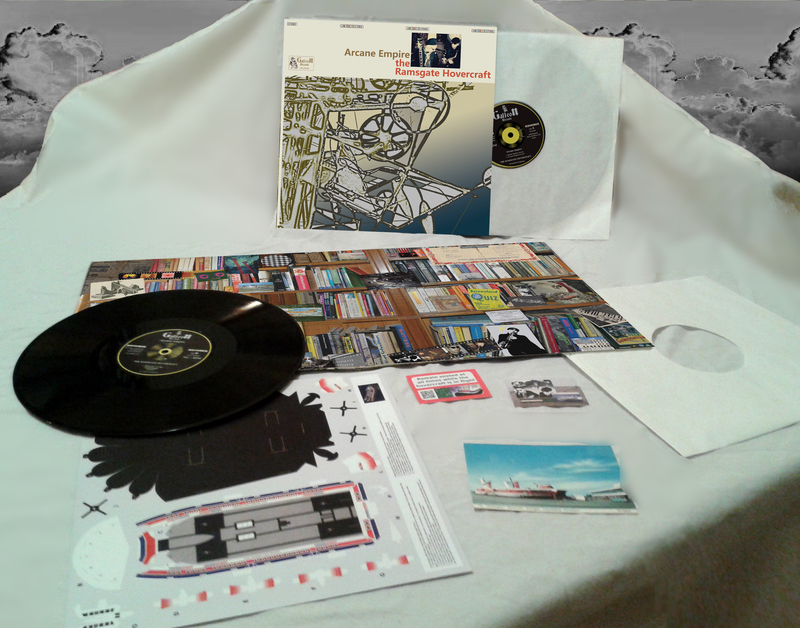 We are excited to announce that Arcane Empire, The Ramsgate Hovercraft’s debut album has just been released. The album contains nine tracks plus four bonus tracks available on download. You can purchase it as a double vinyl LP in a gatefold sleeve with several bonus inserts or as a download from Bandcamp, where you can also hear sample tracks (the price for the double LP includes a full download).